In all sports, youth and scholastic leagues take their lead from the professionals. From league administrators to the players themselves, people involved in youth and scholastic sports model their behavior after those who do it at highest level. This is particularly true in baseball, a sport with a sense of tradition that cannot be rivaled by any other. Young ballplayers grow up emulating the batting stances and wind-ups of their favorite stars, hoping that they can eventually have the same success. As an athletic director or manager, it’s your duty to study the professionals, too. While it’s certainly important to examine big league managers’ in-game strategies, you should also be noting the little things that help teams win as well. An example of this would be the team’s uniforms. If you’re coaching a T-ball team, you can probably settle for the same cheap T-shirt and hat combination that T-ball teams have worn for decades and rest assured that you haven’t hurt your team’s performance. However, if you’re managing a Little League, Babe Ruth, or high school team, you need to be able to outfit your squad in high-quality gear that allows them to not only swing and throw like the pros, but feel like them, too. Here is a list of some of the most popular baseball brands on the market. Rawlings is more known for producing high-quality equipment, such as gloves, bats, and helmets. If you’ve watched a professional baseball game recently, chances are that you’ve seen players wearing Rawlings garb. Because of its sterling reputation as an equipment brand, many teams are choosing to wear Rawlings uniforms now. This is great news for ADs and managers because Rawlings allows you to bundle equipment and uniform purchases into one order and receive a discount. Since Rawlings isn’t particularly expensive to begin with—bats can be found for as low as $100—this is a great deal for any team trying to save a few bucks while still maintaining a professional look. Under Armour is a leading brand in most American team sports these days, and baseball players have gravitated to the company’s high-quality gear—and plethora of price points. Like Rawlings, Under Armour offers gear at a wide range of prices. In youth sizes, their Landsdown jersey and Leadoff pants can be had for approximately $25 each, meaning a whole baseball package (jersey, pants, socks and hat) can be purchased for less than $85 per person. The brand also offers high-end options that can include customized piping and button colors. These types of uniforms usually cost around $130 per player. Unlike the two brands listed above, Adidas doesn’t make youth baseball uniforms, and they don’t have as many affordable options as Rawlings or Under Armour. Yet, managers and ADs in top leagues value the first-rate uniforms and equipment that the company produces. Their stock uniform options (i.e. jerseys with minimal customization) generally cost about $75 per jersey and $55 per pant, but many teams that opt for Adidas are looking for highly customized attire, which is the brand’s forte. 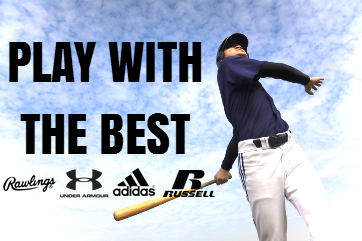 Like Under Armour and Adidas, Russell Athletic isn’t baseball-specific, but it is still very popular in the baseball community. Teams looking to personalize their uniforms should consider this brand. Stay tuned next week, we’ll look at some of the best budget brands when it comes to baseball uniforms. Check out our great baseball package options, or mix and match your own. Mention code "tripleplay" for a free art mock-up and set up.